If you are looking for a quality small builder to finish your basement, build an addition or remodel your home, look no further. 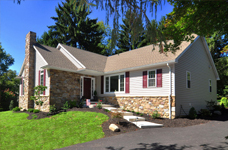 Wenger's Construction specializes in home additions, home remodeling, kitchen and bath remodeling jobs and finishing of basements throughout Lancaster PA. We also serve the surrounding counties of York, Dauphin, Lebanon, Berks and Chester, as well as the greater Philadelphia area. 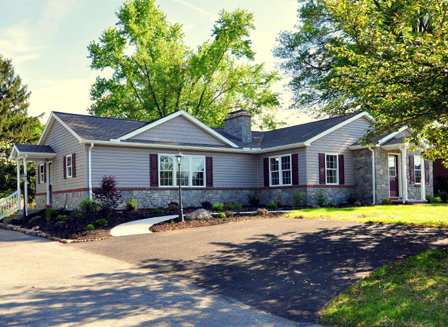 Also being a custom home builder, Wenger's Construction can build your dream house that you have been waiting for. 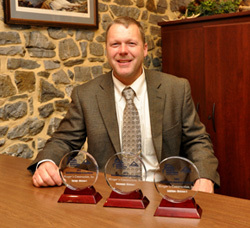 Your satisfaction is guaranteed as we strive for excellence in all we do. No project is too big or too small. Contact us today for a free quote and stop putting off that job you've been waiting for. Basement, Division 1: The goals of the design for this 900 sf unfinished basement were to provide additional space for entertaining, an extra full bath for guests, a private exercise room for the homeowners and plenty of storage. To accomplish these goals, a full bath with a walk-in tile shower was neatly tucked under the staircase. Custom-built cabinetry was installed to provide storage for children’s games, toys & kitchen items. An exercise room was created & separated from the entertaining area with pocket French doors. A kitchen area was created with a bar for additional seating. What was unused & forgotten space in this beautiful upscale home is now a welcoming & comfortable spot in which to spend time with family & friends! Whole House Remodel, Division 1: The clients loved the location of their home but their small ranch home was no longer meeting their needs. Rather than relocate, they chose to completely renovate their existing space and add on the areas that their home lacked. Additions were constructed on the front, side & rear of this 1200 sf ranch home, essentially doubling the floor space! A great room was added to the front of the home and a new front entrance was created. The former living room became a new spacious dining room. Two walls of a former bedroom were removed to create a piano room. The former covered porch is now home to a large mudroom, pantry & laundry area, and a spacious master suite was added to the rear of the home. The entire roof system was removed & new trusses were designed to provide for cathedral ceilings in the kitchen, dining room & great rooms. All existing spaces were renovated and in the end, the transformation was stunning! Commercial, Division 1: This 1950’s ranch duplex had been a rental property for many years and was badly neglected. The new property owner desired a total renovation with additional living space created in the basement for both units. The exterior was stripped of all finishes & new installed. The interior was gutted; all new mechanical systems installed & windows were replaced. Water infiltration issues in the basement were remedied with a complete waterproofing system. Basement egress windows were installed so that the entire lower level could be utilized for family rooms, bedrooms, bathrooms & laundry rooms. 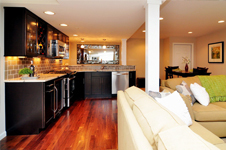 The interior finishes included hardwood floors, semi-custom cabinetry & granite countertops. The end result was a total transformation of a home that was an eyesore in the community. The neighbors expressed much appreciation & gratitude for the effort put into beautifying this property! Michele and I wanted to write to thank both you, and all of Wenger's Construction for all that you have done for us. You took our home from having "a front door" to having a grand entrance way. We still receive compliments on it from friends, neighbors and passersby well over a year later! Also, there aren't many times that one can accurately use the term, "Better than expected." We had very high expectations for our basement finishing project. You and your crew definitely surpassed them! The basement is simply BEAUTIFUL. From the kitchen, to the bath, to the stonework.... we could go on.... People are amazed when we show them the transformation. The things that impressed us the most were the quality of the work, craftsmanship, and attention to detail. Again, thank you for everything that you have done to improve and beautify our home. We strive to provide the highest quality of workmanship to all of our customers, demonstrating excellence in all that we do.